Having just listened to defence questions, it appears that – contrary to my earlier report - the MoD is NOT buying RG-31s. Defence secretary Des Browne announced he was sending 70 up-armoured FV 432s, and 100 "Cougars", procured "through US military sources". 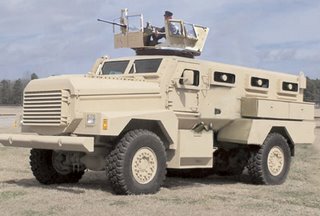 My confusion about the "Cougars" arises from the fact that the name is used informally for the RG-31s and the price range cited would not have covered the larger vehicle also used by the US Marine Corps, also called the Cougar, used by bomb disposal officers. 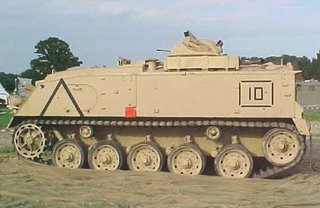 But, Browne's response to Michael Gove, who asked why RG-31s were not being bought, indicates that what we are actually getting is a batch of vehicles from the Americans, intended for the Iraqi Army, designated as the Iraqi Light Armoured Vehicle, based on the same chassis as the larger Cougar. The vehicles, it appears, will be drawn from the batch of 378 ordered from BAE Land Systems (but actually manufactured by Force Protection Inc), which had an option to bring the contract to 1,050 units. It is obviously the speediest way of getting additional armour into theatre. 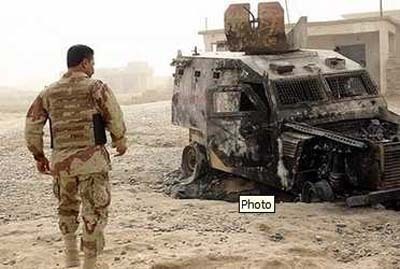 However, it comes to something when the MoD is reduced to buying equipment destined for the Iraqi Army. One has to wonder how the Iraqi's will feel about having to wait for their equipment when they too are driving around in armoured Land Rovers - with the same tragic results experienced by the British Army – and are expected to take on increasing responsibility for patrolling from the British. As relevant, the size of these Cougars makes an absolute mockery of Drayson's contention that the RG-31s are too big. Just short of nine feet high, it is exactly nine feet wide and over 20 feet long, weighing in at 15 tons. The RG-31 is a shorter, a foot narrower and nearly two feet lower. While the RG-31 is built on a light truck chassis – originally the Unimog – the Cougar is built on the chassis of a commercial articulated truck chassis. Make no mistake, though, these are superb vehicles and will considerably enhance the protection afforded to British troops – and they will take the pressure off the hard-pressed Warriors. But patrol vehicles they are not and, if the RG-31 was going to be restricted in the areas it could go, this applies to a much greater extent to the Cougar. The up-armoured FV432s will also add extra protection – the Israelis use the US equivalent M113 – and it will give commanders an additional armoured option, again taking the pressure off the Warriors. However, it is interesting to see that, in Lebanon, the IDF is using converted Centurion main battle tanks for their front-line APCs. Altogether, therefore, this shows the MoD in shambles. Reluctant to take on one new vehicle, it has ended acquiring two more, neither of which is optimal. Nevertheless, it is an improvement, for which we should be grateful.